1819 and established a permanent homestead at Cassidy Lake. This is the story of that journey and their genealogy. The goal of this website is to provide insight into the Cassidys who established the homestead at Cassidy Lake in 1825 and their descendents. The Genealogy section has dates, notes and pictures for individual family members. We hope you find these stories interesting. If you have additional information to share, please send it to us and we'll add it to the website. 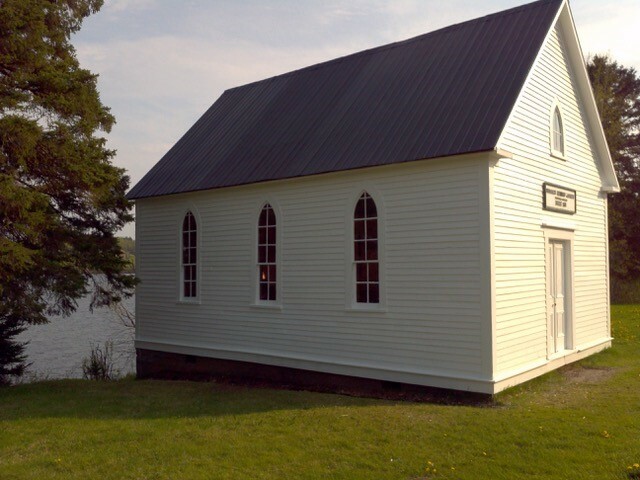 The next Gathering of the Clan at Cassidy Lake is set for Aug. 11, 2019 and we are planning a big celebration of the renovation of the church. It will be 70 years since the last church renovation done by Matthew Cassidy in 1949. As of May 2018, Paul Cassidy, who now owns the church and homestead property, has repaired and repainted the exterior. As you can see from this photo, it looks magnificant.. Hope to see you at the lake. Address: 1130 Knightville Rd, Havelock, NB. This is about 20 km from Sussex. Please note that the Old Bavarian accepts only cash and cheque. A short break for tea, coffee and memorabilia viewing. Airplane Lands on the Lake in 1940; other stories welcome. Social gathering inside/outside the church. No refreshments planned at this time. Accommodations: For those that require a place to stay in Sussex, arrangement has been made at the Amsterdam Inn (143 Main St., Sussex, 506-432-5050). A special group rate of $129 has been negotiated. Please mention the group Cassidy Reunion. The Inn offers a hot complementary breakfast, free parking, free wi-fi and other amenities. For privacy reasons, information on this website on persons still living is restricted to family members.